Healthcare is one of the most important and practical applications of AR technologies that we can come up with,” said moderator Brian Wassom, moderator for a session covering AR’s use in healthcare at the Augmented World Expo in Santa Clara, California, on June 8. The session was an overview of projects and companies finding uses for augmented reality in healthcare, spanning from training and education, to improving sight and determining if a child can sit still for an MRI. The basic overarching idea is to take tasks and functions and improve them with the use of augmented reality. Some presenters’ products are on the market and in use in hospitals. Others are in earlier stages. Either way, here are six examples of what’s happening in the augmented reality and healthcare space. Anyone studying medicine has to learn anatomy. There are many ways to do it — flash cards, textbooks, charts, even things called bone boxes (imagine opening a box of bones and having to use some reference aid to figure out what it is and its characteristics). Those are tried and true methods, but ARnatomy wants to make them better. They’re working on a few projects, including an app that uses OCR to match a word like femur, for example, with visuals and info on the bone, or one that lets users manipulate a “a tangible skeletal model of bones affixed with augmented reality (AR) targets,” according to their site. Having blood drawn is not a pleasurable experience for patients. It only get worse when they have to get stuck again, and again, and maybe once more in pursuit of a vein. AccuVein is essentially a handheld scanner that projects over skin and shows nurses and doctors where veins and their valves and bifurcations are in patients’ bodies — or aren’t, in the case of cosmetic procedures (you wouldn’t want to shoot Botox into a vein). AccuVein’s Vinny Luciano said 40% of IVs miss on the first stick, and the numbers get worse for children and neonates. The device in use in hospitals across the country and they estimate it’s been used on more than 10 million patients, making finding a vein on the first stick 3.5 times more likely. Founder Shafi Ahmed talked about the role wearables and AR could play in medical education. He’s used Google Glass to perform live operations for roughly 14,000 students in 32 countries. The idea is to get students through the learning curve much quicker, and to get them to participate in the global community. The Smithsonian Magazine cited a Lancet study that said there are 5 billion people in the world who don’t have access to safe and affordable surgery. There are 143 million simple operations need to be performed annually, and that requires need 2.2 million surgeons, aestheticians, and obstetricians. Medical Realities also has 360-degree videos on YouTube from the operating theater. In order to take an MRI, the patient has to be very still, notes sciencebasedmedicine.org. This can be a difficult request of a small child. Current Studios developed a tablet game kids can play before they go in for an MRI that measures their ability to lay still for extended periods of time. Their doctors get a dashboard with their stats, and then can better determine if a child would need general anesthetics — and that’s helpful because children shouldn’t be sedated unless necessary, said Current Studios’ president Nathan Kroll. “The majority of people who are legally blind, have some remaining vision,” said Stephen Hicks, researcher and founder of VA-ST. For many of those people, the problems they encounter have to do with recognizing faces, driving, reading, and avoiding objects in their path. The VA-ST visor is intended to be used in the daily life of those with these type of issues. So, for example, the device would create something of a stencil outline around a person’s face to help with recognition, and help improve situations with poor contrast. VA-ST is going to be tested on about 300 people in the UK in the next nine months, and potentially on the market in 2016. They were a 2014 winner of Google’s Impact Challenge. Vipaar is basically a video support solution. For example, in 2013, the company partnered with University of Alabama, Birmingham on an orthopedic surgery using Google Glass. 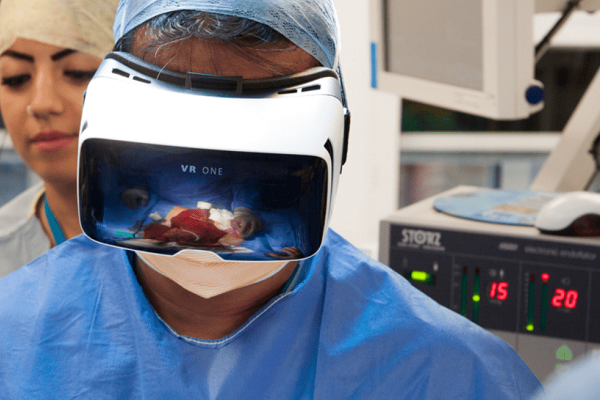 A remote surgeon could essentially project his hands into the display of a surgeon on site wearing Glass and point and guide. They do more than just telemedicine, with the idea of bring in remote expertise to a situation where it’s needed.